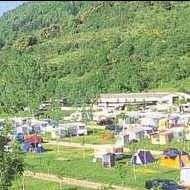 The campsite is situated in the Cameros Natural Park of Å“ierra Onion, about 5â€° km south of LogroÃ±o, La Rioja, on the river Iregua. With plenty of land available, the camp has modern facilities for a comfortable stay for the rest to make journeys on foot or horse around. Open all year. ¡Propuestas para viajar a precios LOW COST! Voyager avec des enfants à la Rioja ! La Rioja con niños, ¡que no pare la diversión!